In 2004, a small-budget game produced by Namco called Katamari Damacy took the PlayStation 2 world by storm. Its simple-yet-beguiling gameplay, involving a young cosmic royalty who rolls up balls of found objects called “katamari,” proved infectious enough to merit a series of sequels. Well, the Katamari phenomenon at last has made it to the iPhone, in the form of I Love Katamari. As with the classic console version, the iPhone conversion puts you in control of a small character called The Prince, as you push a katamari through several levels and over increasingly larger objects that stick to the ball. Once enough objects have been picked up (including cats, dogs, humans, buildings, giant octopi, land masses, and so on), you move on to the next level. Pile It On: As you move through each level of I Love Katamari—by tilting the iPhone fro side to side and forward and back—you can add to the size of your katamari by rolling over assorted items. I Love Katamari incorporates the technologies found in the iPhone by tying the controls to the accelerometer. Simply tilt the handset forward, to the sides and back to control the character’s movements. For sharp turns or U-turns, press the sides of the touchscreen or hit a button at the bottom of the screen to turn on a dime. The iPhone experience of I Love Katamari isn’t quite the same as sitting on the couch, firing up the PlayStation 3 or Xbox 360, and playing for hours on end, but the heart of the game is still there. Namco did a great job with the graphics and music and kept the humor of the game intact its four game modes (Story Mode, Time Attack Mode, Exact Size Challenge Mode, and Eternal Mode). Roll over a building to pick it up, for example, and you can listen to the people inside comically screaming as you play the rest of the level. Physics make all the difference, and I Love Katamari’s physics engine remains realistic as the game progresses. Change the shape of the katamari, and you’ll have an easier or harder time rolling it depending on what you’ve picked up. Where control was once easy and predictable at the beginning of the level, movement becomes that much harder as the larger items you’ve grabbed—such as bridges and land masses—protrude from the katamari. While it’s great to see this game come to the iPhone, there are some significant drawbacks to consider. I Love Katamari is processor-intensive; even short gaming sessions quickly drained my iPhone 3G’s battery. Other shortcomings such as a very inconsistent frame rate hurt the game’s performance. Finally, the controls themselves need some attention. Though the tilt controls work, players may find themselves tilting the iPhone so far forward the game is almost out of their range of vision. While I Love Katamari is a fun way to kill some time and the learning curve isn’t particularly steep, the final product feels more like a technical demo than a finished game. For fans of the series, $8 won’t break the bank and you get a fun game in the process. Still, a lot can change with a few software updates. Tackle some of the flaws, and there’s a terrific product to be had here. 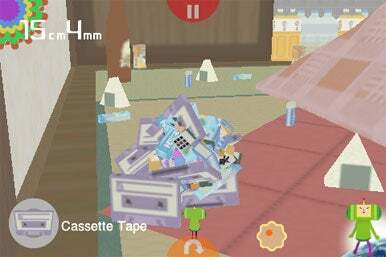 I Love Katamari is compatible with any iPhone or iPod touch running the iPhone 2.x software update.